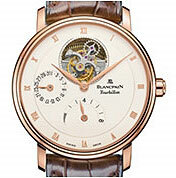 Few watchmakers are capable of making complications. Probably no more than 1'000 in the world can build an ultra-slim watch. There may be a hundred who can produce a minute repeater . At the very top end of the scale, making the "1735" , there are no more than ten or so in the world. "I've made a tool and now things are going to be great, we'll make up for lost time." At Blancpain, the desire to embody the watchmaker's art culturally and technically is expressed in a variety of ways: Besides perfecting old movements, our watchmakers make their own tools, perpetuating a tradition initiated by the forerunners of one of Switzerland's most prized industries. It would have been simply impossible to fit the 740 parts of the 1735 watch movement in the case's 8 cubic centimetres without computerised assistance. The computer proves particularly useful for simulating the interaction of moving parts, finding design errors and confirming the movement's overall coherence. In our effort to go even further, in terms of accuracy and daring, we use powerful computers to better serve centuries-old craftsmanship. We work in a motion that stretches from the past to the future. With the past in mind, we return to the present to prepare the future. Blancpain workshops turn out thousands of different parts, the smallest of which are barely 0.05 mm thick - the thinness of a hair. Little wonder that the movements are protected under glass between manufacturing operations against the smallest speck of dust right up to the instant they are assembled by hand - no mean feat, even for Blancpain's immensely skilled watchmakers. Carved from a solid metal block, every Blancpain watchcase is meticulously shaped and finished. Even the slightest imperfection - a tiny surface roughness, a dimensional error or a flaw in the metal, for instance - is ground for instant elimination. Its interior is mirror-polished to reflect the indexes and improve the legibility of the watch. From initial shaping to final buffing, a Blancpain watchcase requires no fewer than 31 separate specialist operations. The hour markers on a Blancpain dial are all affixed by hand - a delicate task demanding a steady hand and a sharp eye to catch the tiniest flaw or blemish. Assembling a movement is an art in itself. -The steel parts are shaped and finished in three steps: first they are angled with a lime, then polished with abrasive papers (from thickest to thinnest), and finally diamond paste. Other components are satin finished and rhodium plated, a surface treatment that protects them from tarnishing. - After this preparation, which is also a finishing step, the watchmaker assembles the various parts of the mechanism, step by step. He checks its operation at every stage of the assembly process. Regulation of the assembled movement is also an art. The accuracy of the future watch depends on it. Then, placing the movement in the case requires additional extreme care: the least amount of pressure exerted on the mechanism would pose a danger. -Its position must be adjusted to correspond to the setting crown and push-pieces, then exhaustively inspected and checked. But before a movement is cased up, it must be lubricated - at no less than 100 oiling points, representing a total weight of 1/2 milligram of lubricant. Once the watch is cased up, it is inspected and tested for 100 days. Weeks of selecting the skins specially reserved for Blancpain, entire days of tanning in the shades exclusive to Blancpain, then 37 minutes to hand-sew each and every leather strap! All the art of leather and saddlery brought together to give that special unique touch to Blancpain leather straps. The ultimate innovation for the greatest comfort is the natural rubber lining for the water-resistant leathers. These straps withstand the most extreme conditions for comfortable wear in all circumstances. The bracelets represent an important accessory for many watch owners. Not only do they complete the aesthetic design of the watch, but they are essential to its wearing comfort. Each Blancpain bracelet is designed for great suppleness in order to adapt comfortably to the shape of the wearer's wrist. They are finished and polished by hand according to the tradition of the master jeweller. While their redesign in no way challenges the primacy of stainless steel, Trilogy bezels, crowns and pushpieces feature components made of rubber. This unexpected aesthetic touch improves handling comfort while adding intriguing character to a design that fittingly complements their "Black Sun" dial featuring facetted hour markers and figures. Ingenious design featuring alternating links of steel and fibreglass-reinforced rubber. Enduring yet utterly stylish, Concept 2000 bracelets provide exceptional suppleness and wearing comfort. Framing and enhancing the bezel figures, rubber also provides a more comfortable grip on the bezel's ribbed rim. Softer and more pleasant to the touch. Improved handling ease and all-round protection.